Recommended to: Readers who love a good contemporary and aren't afraid to cry. 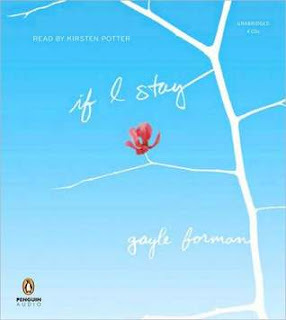 Kirsten Potter does a fabulous job as a narrator in If I Stay. I fully believed that she was Mia, and she brings life to this character that is hard to ignore. I'm honestly glad that I listened to the audio book. Potter's voice will draw you in and keep you listening. Ready to cry? If you haven't read If I Stay yet, you are missing out. Find a copy. Seriously. I'll wait. Mia's story is equal parts heartfelt and heart wrenching. I warn you, pick up a box of tissues before you start reading. This is one that is going to make you cry. For Mia, life is fairly perfect. She's intelligent, talented, and has a loving family. In fact, her family is the type of perfect that we only see in movies. Joking over breakfast, supporting one another through anything, it's just all too sweet. Mia has one big decision weighing on her mind. Stay in Oregon to be near her family and boyfriend? Or move to New York City to attend Juilliard? It's all too much for her to think about. So she loses herself in taking a drive with her family. Then, in an instant, everything changes. Mia is on the cusp of the afterlife. Caught somewhere between the living and the dead, Mia can see and hear everything around her but cannot communicate with those around her. The choice that faces her now is simple. Stay alive, but without her family? Or just let go? Through alternating flashbacks of her past life and present state, the reader learns about those closest to Mia. We are given a look into her life and what she stands to loose if she lets go. What Gayle Forman gives the reader is a story that will tug at your heart strings. I was constantly torn between wanting her to leave and be at peace, and stay for so many reasons. This is a book that will make you feel so many emotions that it's almost overwhelming. If I Stay is one of the most touching stories that I've ever read. This is a book that will break your heart in a wonderful way. I know that no matter what I write here, there is no way to do Gayle Forman's gorgeous book the justice that it deserves. Instead I give this my highest recommendation, and simply demand that you get out there and find a copy. Oh, and also a box of tissues.